Observing sharks in their natural environment is a truly amazing experience. Observing sharks in their natural environment with real shark experts takes that experience to a whole new level. As part of our ethos of education, we offer a limited number of expeditions every year. Each small group excursion is led by scientists from SRI and others. These are once-in-a-lifetime opportunities to experience sharks in the wild with likeminded people who share your passion for these awe-inspiring animals. We hope you join us for an adventure you’ll remember forever. The largest aggregation of whale sharks in the world, the “afuera,” occurs each June through August off Mexico’s Yucatan Peninsula. The sharks amass to feed on dense patches of fish eggs, making this the rare place where you can see and photograph whale sharks in blue water. Truly a wonder to behold. Two separate five-day expeditions are being offered, each including three-days of snorkeling with the sharks. The trips are led by Dr. Jennifer Schmidt, the Shark Research Institute’s Director of Science and Research, who has extensive experience working with whale sharks for nearly 20 years. Whale shark interactions are snorkel-only by Mexican regulations (for the protection of the animals), but excellent scuba diving and many other activities are available before or after the trip. These expeditions will fill quickly, so reserve your place now. $1,400 per person includes: 4 nights double-occupancy hotel in Cancun; 3 days of whale shark interactions; lectures on whale sharks by Dr. Schmidt; snorkeling at Isla Mujeres; and, lunch on whale shark days. Each traveler is responsible for their own airfare, airport transfers and meals (except lunch on whale shark days). The single supplement is $200. A $500 deposit is required to hold your place. All payments are nonrefundable. Travel and dive insurance are required. Dr. Jennifer Schmidt working. Photo by Marie-Elizabeth Mali. Join SRI’s Hawaii Regional Director Charlie Fasano as he captures images of Hawaii Tiger sharks for an important identification project. 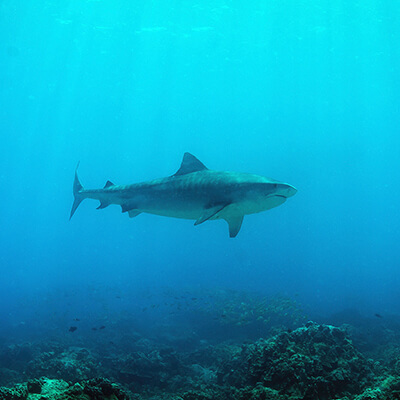 The expedition includes daily boat dives to catalog resident Tiger sharks of Big Island, Hawaii. Tiger sharks and dolphins will be viewable. Manta Ray and Blackwater night dives are also available at an additional cost. This project enables citizen scientists to catalog individual tiger sharks to determine their annual use of the area. The project will also increase the biological information available to guide conservation efforts for this species, on both a regional (Hawaii) and global scale with important data such as life history, species distribution, abundance and diversity, population productivity and extinction risk. This information will then be used to inform international conservation forums, such as CITES, as well as local fishery risk assessments and management plans. An education and awareness campaign on the status of Hawaii Tiger sharks will be conducted in conjunction with the survey to increase awareness of the habitat use of the species. Read an article by Charlie Fasano from Scubashooters Magazine, "An Anomoly of Nature, Tiger Sharks in Honokohau, Hawaii" (go to pages 28-36). Reservations are being taken now, reserve your space today. Resort accommodations will be at Courtyard King Kamehameha Kona Beach Hotel by Marriott, Kailua Kona, HI (garden room; upgrades available). See detail page for important additional information regarding costs and trip requirements. Join this expedition led by SRI Director of Science and Research, Dr. Jennifer Schmidt, to study the whale sharks that aggregate in the Gulf of Tadjoura, Djibouti, Africa. Djibouti hosts an aggregation of the youngest whale sharks found anywhere. Most sharks are between three-and-five meters with two-meter animals occasionally seen. Participants will act as research assistants, documenting whale sharks by photo identification, collecting and analyzing plankton samples and hopefully observing night-feeding behavior. Research goals are to understand where these animals come from, why young sharks congregate in the area, and where they go when they leave. Our home for this liveaboard expedition is the M/V Deli, a Turkish gulet that accommodates 12 people in shared rooms with private baths. The chef prepares a daily menu of local and continental cuisine. Whale shark interactions are snorkel only, but excellent diving is available from the boat at sites such as Ras Korali, Turtle Point, Moucha Island, and La Faille, a convergence of tectonic plates. Whale shark interactions and diving are available each day, and participants may choose any combination of activities. The site is remote and accommodations basic, but the experience is unmatched. Share this unique wildlife expedition to a stark and beautiful corner of the world. $2,200 per person includes: shared accommodation on the boat, double occupancy hotel for the nights of December 6-14, all meals on the ship, hotel and port transfers, and a tax-deductible donation to the Shark Research Institute. Please be aware that payments made through PayPal will incur an additional $50 per person processing fee. Each traveler is responsible for their own airfare, Djibouti visa, soda and beer, and meals off the ship. Post-trip excursions are available to explore the geologic formations and vast salt lakes of the East African rift valley. A $500 deposit is required to hold your space. All payments are non-refundable. Travel and dive insurance are required.